We present nine polymorphic di- and tri-nucleotide repeat nuclear microsatellite markers selected specifically for their use in high throughput studies concerning the dioecious allotetraploid Salix alba–Salix fragilis willow complex. These taxa and their hybrids are difficult to discriminate using morphological characters. Thus, multiplex reactions were developed for these microsatellite loci and their effectiveness to distinguish individuals, especially hybrids, and their inheritance patterns in controlled crosses were determined. All loci displayed disomic–monogenic inheritance which allowed for the genotype data to be analysed as for a diploid organism. The nine loci produced a total of 67 alleles (mean, 7.4 alleles per locus; range, 3–11 alleles) in a reference panel of 57 individuals from two germplasm collections and natural populations. Gene diversity values (as measured by the expected heterozygosity) ranged from 0.000–0.820. 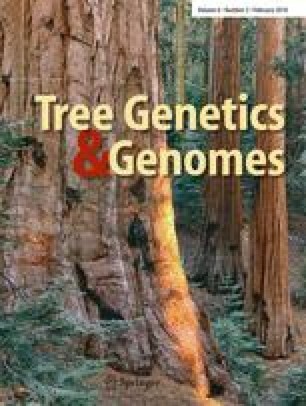 A total of 53 distinct multilocus genotypes were observed, and ordination analysis revealed three separate clusters corresponding to S. alba, S. fragilis and hybrids. The microsatellite loci described here will be used in population genetic studies to investigate genetic variation, gene flow, levels of hybridisation and the extent of introgression in natural populations of the S. alba–S. fragilis complex. They are also useful for clonal identification, conservation and sustainable management of germplasm collections, genetic mapping and the selection of individuals and/or certification of controlled crosses for breeding programmes. This research was funded by the European Commission Framework V Programme (contract no. QLK3-CT-2000-30227). The authors wish to thank Steve Hanley and Kevin Lindegaard for help with marker development and controlled crosses, respectively, and Karolein van Puyvelde and Ludwig Triest at Vrije Universiteit Brussel for collection and DNA extraction of material from the INBO collection. Rothamsted Research receives grant-aided support from the Biotechnology and Biological Sciences Research Council, UK.